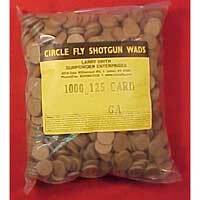 Circle Fly Wads -For muzzle loading shotguns. 14 gauge wads work well in light Italian made reproduction double shotguns from Navy Arms, etc. Use 12 gauge wads in Navy's heavier classic double muzzle loading shotgun. Card wads for muzzle loading shotguns. .125" thick, 1000 /bag.